Liz: Wow. Those pants are pink. Me: Nice and springy, aren’t they? Liz: Why are you wearing that shirt with it? Me: What shirt would you recommend? Liz: White. Or cream. Or just not wear those pants. H’mm. Was I too adventurous? You can’t see it in the picture, but my toes are robin’s egg blue. Do I look like an Easter egg? 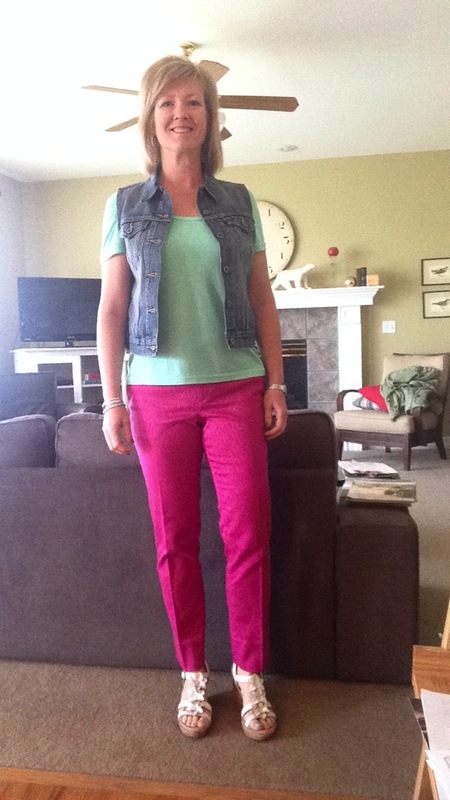 This entry was posted in Fashion and Beauty, My outfits on April 24, 2014 by jennifernastu. I ❤️these pants! I’m so impressed with how great your legs are. I think I need to see this outfit in person to decide wether I like the shirt with it or not. I’m seeing where your going with color on color but I have a feeling it’s the wrong value of blue. It’s ok but with those gorgeous pant you need a ‘wow’ shirt. I think I like the jacket too. Bravo on going out of your comfort zone with the pants! They look amazing!! !